Business transformation requires focus on top-line growth. In order for innovation to accelerate business transformation, innovation must be sustainable, and as a result top-line growth must be impacted. Innovation drives top-line growth leading to increased revenue and increased gross sales. Two simple goals continue to perplex companies: 1. growing revenues, or generating top-line growth and 2. increasing net income, or producing bottom-line growth. Innovation requires laser focus on top-line growth and here’s why. "Customer first" thinking – first we are not necessary referring to an increase in profit when we speak of top-line growth. In fact, profit could be flat or even slight decrease. We are talking about growing revenue over a period typically over quarters or even years. Top-line growth refers to revenues or gross sales generated by the activities of the enterprise and its name originating from their relative position in the financial reports e.g. the Income Statement or Profit & Loss Statement. This growth includes innovation initiatives and new product development. You may hear that ‘real top-line' growth refers to gross profit – that's simply an incorrect use of the term. Think of brand amplification, consumer service and engagement, customer retention, decreasing customer attribution, maintaining or growing market share, and other types of growth such as mergers and acquisitions that are beyond what organic growth can offer. 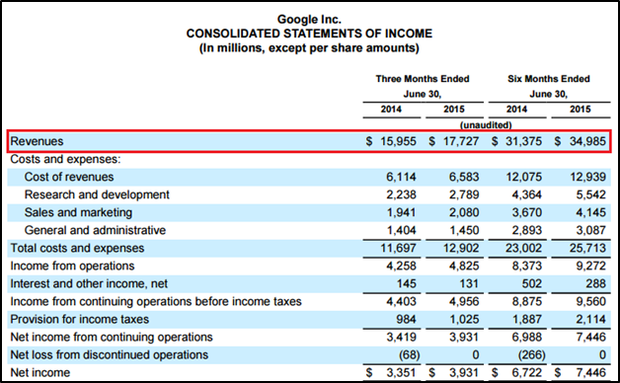 Below is an example from Google Inc.’s Consolidated Statements of Income (Form 10-Q) for the quarterly period ending June 30, 2015. You’ll notice that revenue is the 1st line item listed in the financial statement. Understanding top-line growth implies that a rudimentary grasp of bottom-line growth is already in hand. "Cutting cost or eliminating waste thinking" – financial controls around better cost-conscious spending, removing unprofitable parts of the business, and introducing or expanding automation is the core of bottom-line growth. Cost-containment such as off-shoring, business process outsourcing (BPO), knowledge process outsourcing (KPO), and information technology outsourcing (ITO) each aid in cost savings. These approaches can improve operations – none will transform your business for the long term. Business transformation requires a focus on top-line growth. Innovation must impact top-line growth for innovation to accelerate business transformation. Are you having trouble securing funding? Was approval for the innovation lab deferred? Ask yourself, when was the last time you updated the board and your leadership team on how your organization was positively impacting top-line growth. You probably can’t recall the ‘specific’ example. Innovation strategies require more than merely displaying impressive technology, cloaked by well-executed integrations into new business models – innovation strategies must grow revenue. Success got you here, but it won’t get you there. The relevance of innovation is fundamental to competitive survival. The article, “Driving Success: How You Innovate Determines What You Innovate” by Marc J. Epstein, Tony Davila, and Robert Shelton does a great job of underlining the importance of growth over cost-containment. In Epstein’s book, “Making Innovation Work: How to manage it, measure it, and profit from it,” the seven innovation rules are an excellent reference when constructing your innovation strategy. 7. Create the right metrics and rewards for innovation. We must encourage risk-taking. “Without innovation, you stall, your competitors take over, and you die," said Epstein. There is no middle; your organization is either growing or dying. Take a minute to reflect and identify which path your organization has accepted. 1. Are you sourcing more ideas externally or internally for your innovation pipeline? If you are not sourcing more ideas from external sources, you’re missing opportunities to identify radical new ideas and leverage growth from industries outside your own. 2. Do you empathize with your customers? Are you solving existing customer issues or resolving issues they haven't yet experienced? If it’s the latter, you’re heading in the right direction. 3. Is innovation part of your core business model? It’s no longer good enough to innovate; your innovations must challenge your traditional products and services offerings. This approach is disruptive and creates more value with superior outcomes. Consider how Business Model Innovation (BMI) can be the underpinning of your business strategy, not a line item underneath it. 4. Do you manage a pipeline of strategic growth opportunities and do they have to fund? Saying you want to do something, doesn’t make it happen. Why do we at the strategic level talk about innovation, talk to our teams about disruption and then somehow the conversation stops short of getting those initiatives funded? Having an innovation strategy means providing dedicated funding, just as a strategic target to grow sales requires a greater cost investment. Innovation strategies need capital. Manage your innovation and growth options through an innovation portfolio. 5. Is your organization committed to innovation as a core competence? Individuals spark and drive change, organization tag along. However, as a senior leader you need to institutionalize innovation competencies into growth targets, staff performance reviews, and embed innovation into organizational hiring practices. 6. Have you created a culture of innovation? Is your organization known for agility and creating unique products and services? Does each employee in your organization internalize the value of failing fast? These are indicators you’ve established an innovation culture. Corporate surveys and KPIs don’t measure an organization’s ability to innovate. These only focus on outputs and frankly most of these are too subjective for my taste. Innovation capabilities are measured by inputs, throughput, and output. 7. Is your organization disciplined when it comes to innovation? Are ideas popping up randomly in meetings? Didn't we talk about that last year? These are both examples of a breakdowns in innovation discipline. Discipline defines high-performance cultures. Defined repeatable processes, ingest, evaluate and manage a transparent decision process leading into the innovation pipeline. Determine if your organization embraces these principles for breakthrough innovations that lead to top-line growth. Product diversification doesn't produce top-line growth. Cost-reductions don't generate top-line growth. Innovation is the essential element that produces top-line growth.